Hell-Born is an extreme Polish metal band which follows its countrymen's pattern of having members from several different bands. Hell-born kicked off its name-recognition campaign off with a 1986 EP called Hell-born for Pagan Records before graduating to full-length albums. The band was was formed in 1995 and recorded its said EP at Warrior Studio. With Les being busy in Behemoth, the band went into hiatus and was only resurrected in 2001. A comeback demo called Hellblast was issued jointly by Pagan and Conquer Records and the band began issuing CDs through Conquer Records. Bastek left at the end of 2002 ostensibly because he lived too far from the other members. The band has toured in Europe with Vader and even hit North America. 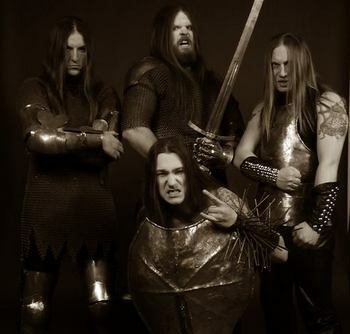 The band's Cursed Infernal Steel album was recorded at Hertz Studio and out through Conquer Records in early 2006. The band’s Legacy Of The Nephilim was also issued in America by Ibex Moon Records.